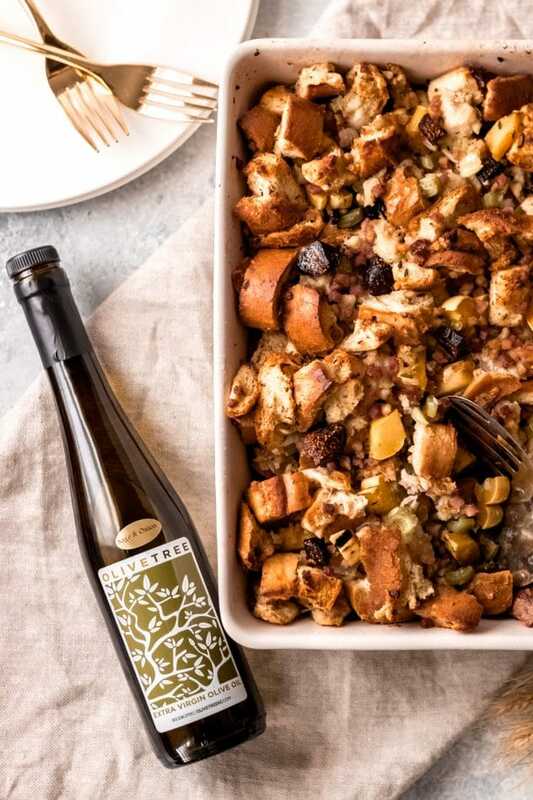 Enjoy this classic elevated dish, Sage, Fig, and Pancetta Stuffing, this holiday season. This sponsored post is in partnership with Olive Tree. All thoughts and opinions expressed herein are my own and not influenced by the company and its affiliates in any way. While I enjoy classic holiday dishes, sometimes I do like to elevate them just a bit, like with this sage, fig, and pancetta stuffing, in partnership with Olive Tree. The classic flavors of sage and thyme are still there, but with the added subtle sweetness of the dried figs combined with the saltiness of the pancetta. First, let me introduce you to my favorite place to shop for fine oil and vinegars, Olive Tree, located just outside Kansas City, Missouri. They offer a variety of extra-virgin, infused and flavored olive oils, grown and pressed in mills worldwide. They also offer aged balsamic vinegars, sourced from Modena, Italy. 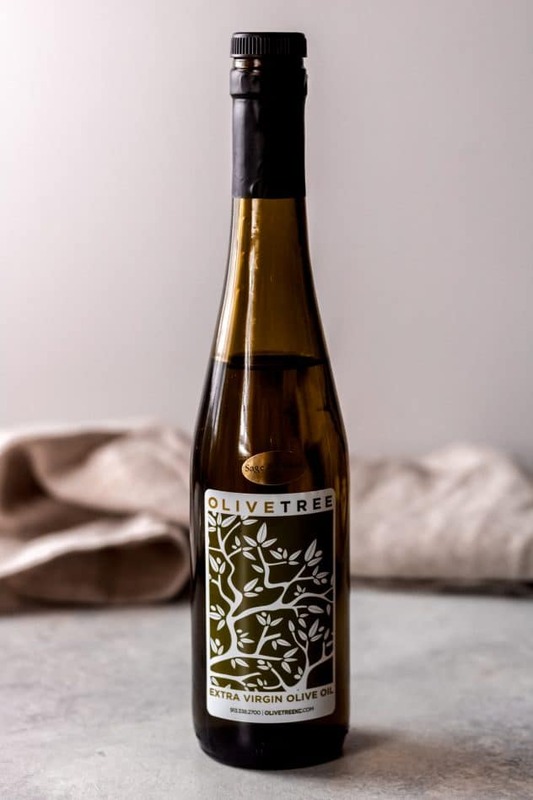 Mindy, the owner of Olive Tree, ensures that you get only the highest quality when it comes to her oils and vinegars. If you’re in the Kansas City area, stop in for a taste test and chat with Mindy, she knows her stuff when it comes to the oils and vinegars, especially when it comes to sourcing and quality. If you’re not in the Kansas City area, have no fear, you can shop online and have the products shipped right to your doorstep! 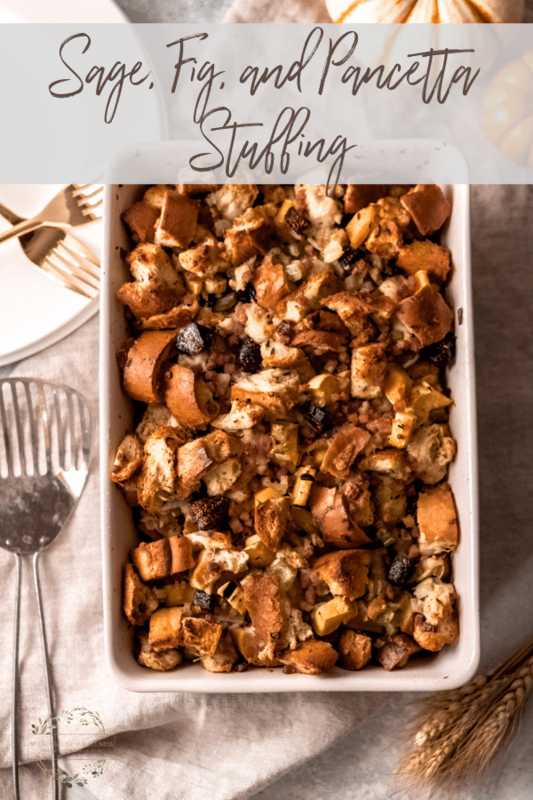 I’ve partnered with Mindy to bring you a new monthly recipe featuring her quality extra-virgin olive oils and vinegars, and this sage, fig, and pancetta stuffing was at the top of the list, just in time for Thanksgiving! This recipe features the Sage & Onion Infused Olive Oil. Just smelling this oil reminds you of Thanksgiving dinner. Sautéing the vegetables in this Sage & Onion Olive Oil allows them to soak up those seasonal flavors. Rather than relying solely on the dried herbs and seasoning, the flavors become infused in the fresh onion, celery, and delicata squash. Then, add in the crispy pancetta and dried figs, and you have a savory dish with a hint of sweet. 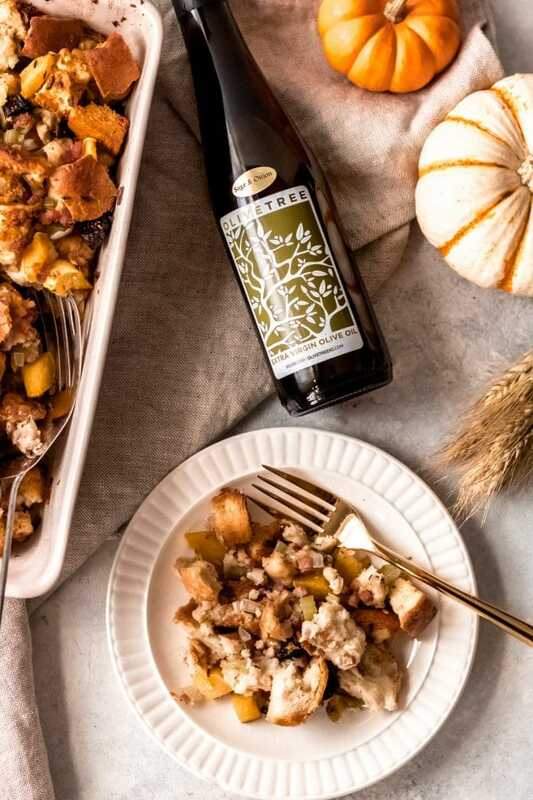 If you want to elevate your Thanksgiving menu, then you’ll want to try this sage, fig, and pancetta stuffing. Your dinner guests will love this simple yet elegant dish. 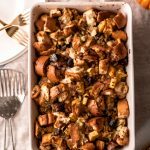 Enjoy this elevated classic holiday dish, sage, fig, and pancetta stuffing, this holiday season! Cut the Italian bread into ½ inch cubes. Lay flat onto a baking sheet, cover loosely with parchment or wax paper, and let sit for 24 hours. 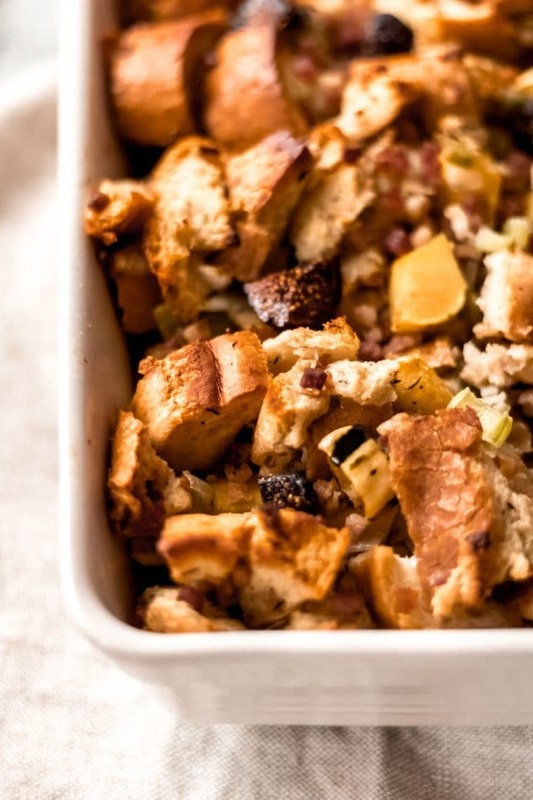 Transfer the bread cubes to a large mixing bowl when you’re ready to start assembling the stuffing. Add the Olive Tree Sage & Onion Olive Oil to a large skillet and warm over medium heat. Once the oil is warm, add the onion, celery, squash, thyme, sage, and salt. Cook until slightly softened, then remove from heat and pour over the bread cubes. In a separate skillet, add the diced pancetta and cook until it begins to crisp. Add the chopped figs and cook for another 1-2 minutes. Remove from heat and pour over the bread cubes, including all of the fat and drippings from the pan. Add the chicken stock to the bread crumbs ½ cup at a time, using your hands to mix it all together. 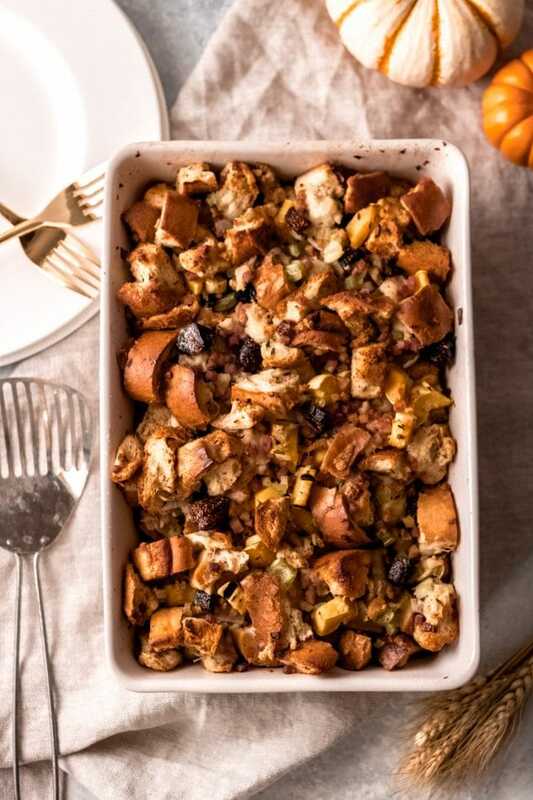 Transfer the stuffing mixture to a greased 9×13 dish and bake for 45-50 minutes, or until the top is golden brown. To chop the delicata squash, slice lengthwise from top to bottom and then spoon out the seeds and stringy membrane. Leave the outside skin intact.